A land-locked central Balkans country of over 7.5 million, Serbia is a member of the Council of Europe (CoE) and a candidate for EU accession. Serbia has ratified the Convention on the Elimination of All Forms of Discrimination against Women (CEDAW) and its Optional protocol as well as the Council of Europe Convention on Preventing and Combating Violence against Women and Domestic Violence. A Gender Equality Law was adopted in 2009, as well as a National Strategy for the Improvement of the Status of Women and Promotion of Gender Equality accompanied by an Action Plan for the period 2010-2015. The country’s priorities regarding violence against women are outlined in the National Strategy for Prevention and Elimination of Violence against Women in the Family and in Intimate Partner Relationships (2011-2015). A National Action Plan for the Implementation of the United Nations Security Council Resolution 1325 on Women, Peace and Security (UNSCR 1325) was adopted in 2010 for the period 2010–2015. In line with these commitments, the Government of Serbia has undertaken measures in the area of gender equality, such as electoral quota, protocols for combating violence against women, targeted support to women’s entrepreneurship, and initiating gender-responsive budgeting. Women’s NGOs and gender advocates have played a critical role in making these achievements possible. Existing efforts on gender equality need to be advanced, expanded and become a regular part of government institutions’ work and financing. Challenging stereotypes about the roles and contributions of women and girls requires a long-term commitment at all levels. The position of marginalized women, who are discriminated on the basis of gender and other factors such as ethnicity and age, need significantly more efforts. Despite laws and policies promoting gender equality, women are under-represented in decision-making in all spheres of Serbia’s social, economic and political life. Quotas in the National Assembly have led to greater political participation by women which represent 33% among Members of Parliament. However their participation in decision-making in the executive branch of government, and at the local level is significantly lower. There are only 5% municipal presidents or mayors who are women. As a result, political discourse and budgetary allocations do not focus on or adequately finance gender equality measures. Studies have found that one in two women in Serbia has experienced domestic violence, and that women and Roma are the groups that are considered most subject to discrimination. Discrimination and structural barriers lead to a gender pay gap and significantly lower labour force participation rates for women than men. At the same time, women spend double the time than men in unpaid care work in the household. Since 2006, the UN Women Programme Office in Serbia has supported national partners’ efforts to meet the country’s national and international commitments on gender equality, particularly CEDAW and the National Strategy on Gender Equality and Improving the Status of Women. UN Women also chairs the UNCT Gender Theme Group which serves as a platform for coordination, information sharing and joint actions of the UN in the area of gender equality. See more publications from Serbia here. See more news from Serbia here. 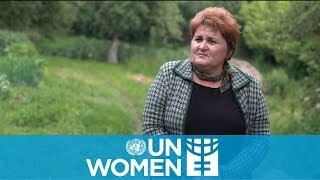 Women Councilors Networks in Serbia, recently established with the support of UN Women, have started taking action across the country, especially in the most underdeveloped and disadvantaged communities, to overcome patriarchal and traditional norms and empower women to uplift their communities.